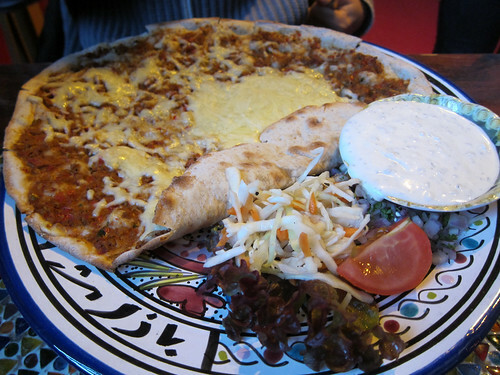 A final cornucopia of restaurants and cafes in Amsterdam post! The one main thing I was really looking forward to in Amsterdam was stroopwafels and so there are two places featured here with them. Oh, how I miss them! On our first morning, we headed to Lanskroon to get one of their famous giant stroopwafels for breakfast. There was a choice of flavours but I had already decided as soon as I heard…coffee-caramel! While this stroopwafel was served cold, its waffle-biscuits still had a remarkable crispness to them. Delicious. We also split a ham and cheese croissant, which they first heated up again in their oven in the back. 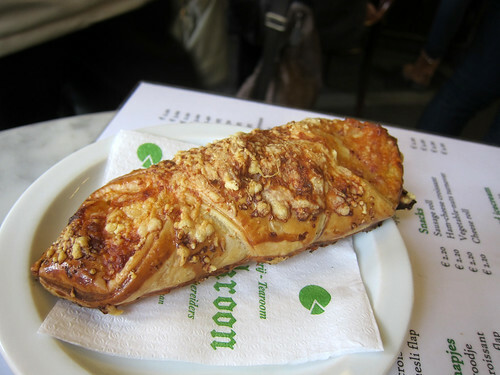 Can any other simple savoury croissant taste any better than this? I think not. 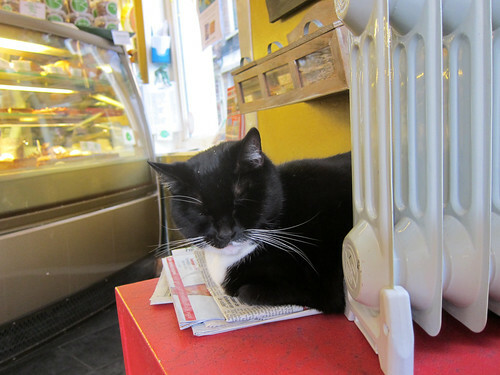 The bakery’s cat did well to snooze by the electric heater on that cold day. We got our first (and only, so far) taste of Surinamese food at a branch of De Tokoman near the Rembranthuis. 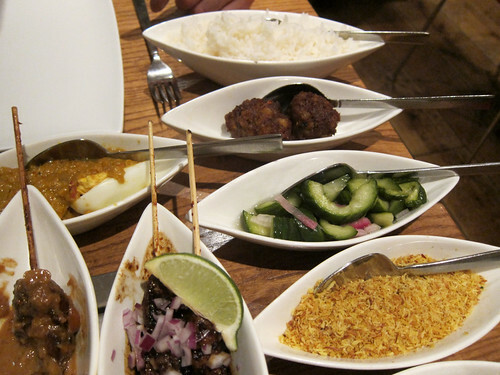 It was a great surprise to us how much of an overlap there was with Indonesian food and how there was even a hint of Portuguese influence (they have a spiced salt cod dish). 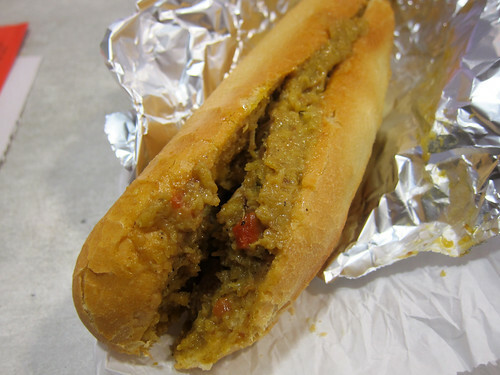 I’m certainly not going to attempt to describe this country’s cuisine when I barely understand the history of Suriname so I’ll link to the Wikipedia entry for now! A lunch box of fried noodles, vegetables and babi pangang (grilled pork) wasn’t too inspiring but I think we chose poorly here. 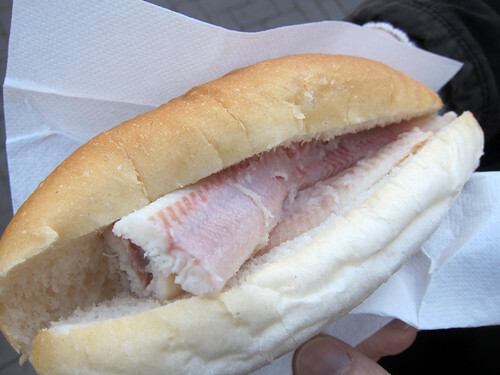 Much better (excellent, in fact) was a broodje pom – a sandwich filled with the Surinamese speciality of pom, a casserole of spiced chicken and pomtajer root. The women working there were friendly and chatty and happy to explain any aspect of Surinanese food. 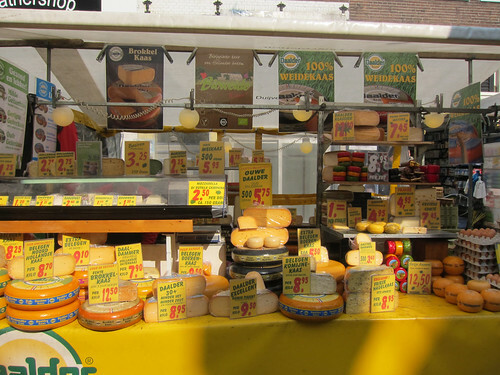 The next morning, we headed to Albert Cuyp Markt and wandered down the street perusing cheeses and herring and flowers in the freezing cold. Business seemed a bit slow that morning but I think that was again down to the weather. We escaped the cold with lunch at Bazar, also along the the same street as the market. 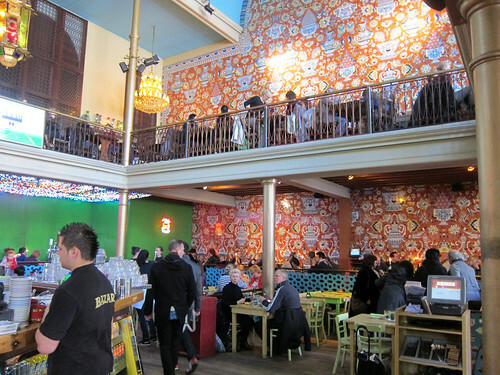 Again, prior to our trip, more than one person kindly recommended having a meal at this colourful Middle Eastern eatery in a converted church. We launched on tender veal ribs and a lahmacun with cheese and washed it all down with lots of mint tea (with both fresh mint and black tea). Good eats in a fun place with a great atmosphere. I opted not to have dessert at Bazar (though they did look good) and instead walked out again to the market to visit the Stroopwafel man. 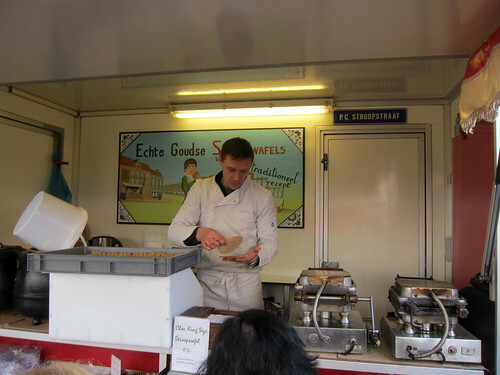 Yes, another stroopwafel for us – and this time they were served hot off the iron. When we chose one with chocolate, we elicited a highly unexpected ear-to-ear grin from him and the words “An excellent choice!” I think we may have been the first ones to order chocolate that day. 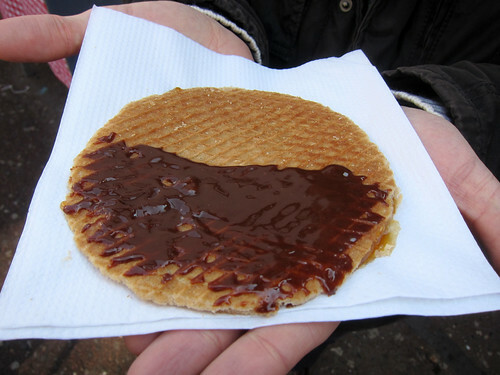 The hot gooey stroopwafel with its extra chocolate syrup was just gorgeous. Highly recommended. 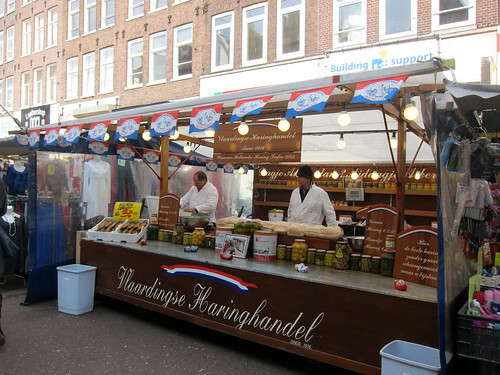 There just wasn’t any space for herring on our trip but we did find room for a bit of another fishy special, Dutch smoked eel from Frens Haringhandel on Koningsplein. Four thick pieces were stuffed into a soft bun and to our surprise, no sauce or spread was added. It certainly didn’t need it as the smoky eel was moist enough. Finally, we also went one night to the Pancake Bakery for a Dutch pannekoeken dinner. It was terribly touristy but the pancakes being churned out were very good. 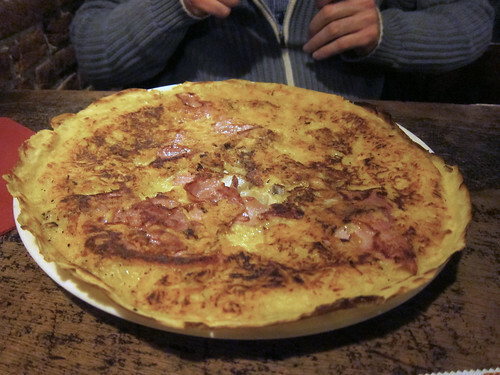 I loved how the cheese in our savoury pannekoeken was cooked in and formed a thin crispy crust. 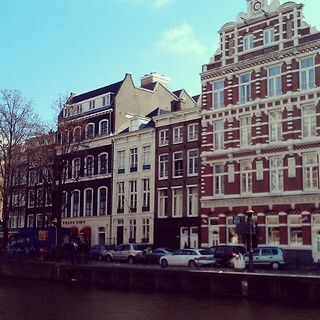 And that brings my series on Amsterdam to an end. As is usual, all my photos from our trip can be found in this Flickr photoset. Now please tell me…is there anywhere in London that sells fritessaus? 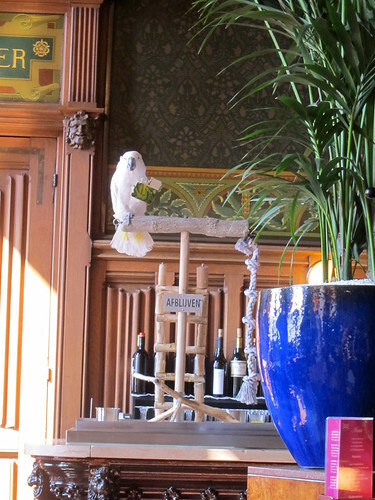 While cozy brown cafes seem to be the places to visit in Amsterdam, somehow we never made it to one, opting instead for the newer, brighter, airier grand cafes. 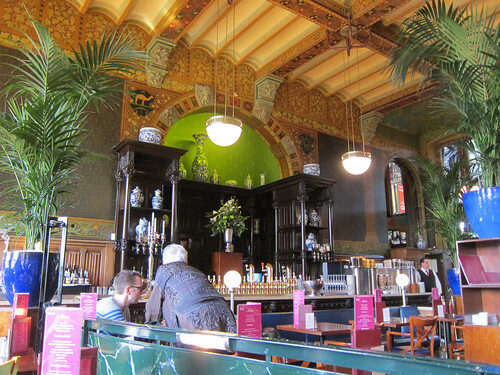 The grand cafes of Amsterdam are usually spacious and beautiful and well worth a visit for a bite or just to rest one’s feet. 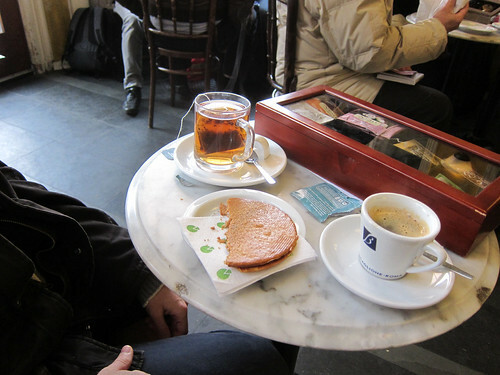 We spent our last morning in Amsterdam at Cafe de Jaren, a beautiful cafe in the university district of the old city. There was plenty of space for us and our bags and suitcase and we spent a calm couple of hours here snacking and poring over their reading material. Something we discovered absolutely everywhere in Amsterdam is the existence of verse munt thee on the menu. 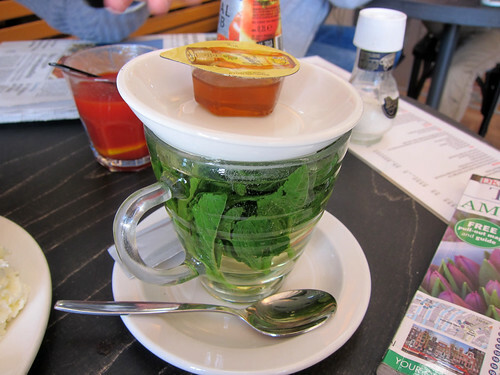 Fresh mint tea. This is fresh mint leaves steeped in water and strictly isn’t actually tea but a tisane. Honey is always offered with it though I think I prefer it as is. It’s something we became addicted to over there and that we’ve brought back to our home in London. 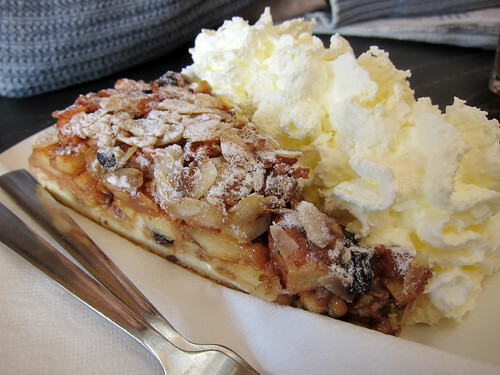 We took this opportunity to try their version of the Dutch apple tart too. While it was delicious, studded with raisins and topped with flaked almonds, it was served disappointingly cold and would have been about a billion times better warm. If the weather had been more cooperative, we would have been able to sit in their terrace leading directly onto a canal. This would have been the view! After killing some time in the shops and having more frites, we headed to train station to wait for our Thalys train to Brussels, where we’d connect to the Eurostar. Our first destination within the station though was the 1er Klas Grand Cafe, where we went in search of some light refreshment prior to our train journeys. The room was originally the first class passenger lounge in the station which explains how luxurious it looks! The bitterballen at this cafe are sourced from the famed patisserie Holtkamp (we tried to visit the day before but they had an extra long queue thanks to it being Easter). 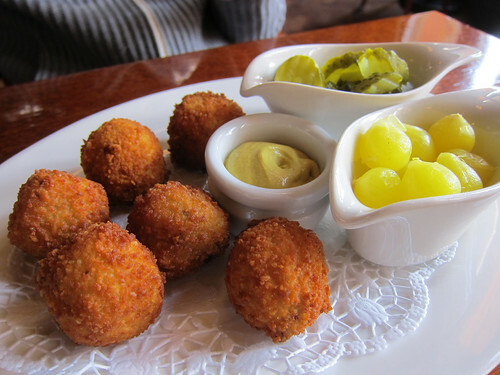 Their bitterballen are considered to be some of the best in Amsterdam and they are indeed fantastic. Crisp crumbed on the outside, creamy meaty bechamel on the inside – our order of six were served with mustard and pickles. They’re fantastic bar snacks. 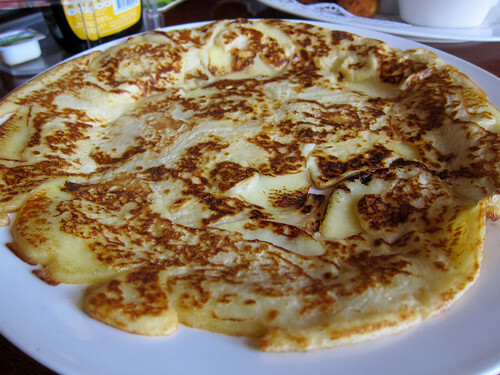 An apple pancake was accompanied by butter, powdered sugar and stroop (syrup) – everything you might want with a pancake. I’ve definitely developed a thing for the eggy Dutch pancakes. And perhaps the best part of the cafe? There’s a house (cafe?) parrot – say hello to Elvis! The white cockatoo loves grooming and shredding bar coasters and the regulars love to have him on their shoulders! A name that came up again and again prior to our trip to Amsterdam was Vleminckx. 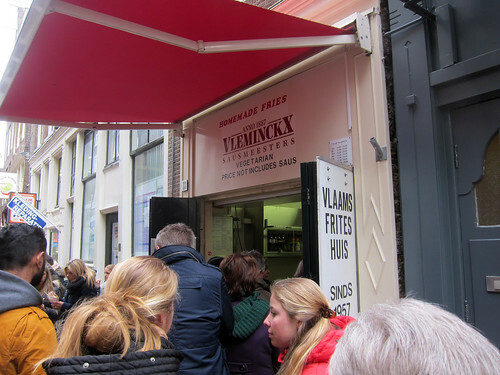 Here, in a tiny hole in the wall, the best Flemish frites could be found, they all said. And they were right. There’s almost always a line there but it moves quickly. Choose one of three available cone sizes of frites and then your sauce (or combination of sauces). We had our chips topped with mayonnaise and ketchup – mayonnaise was the way to go! 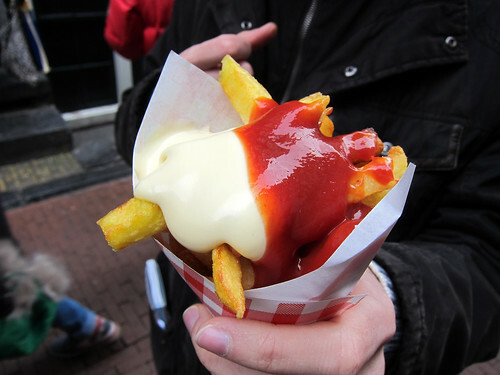 The Dutch mayo (or is it fritessaus?) is supremely creamy and has a touch of sweetness that goes with the salty chips very well. The chips themselves were perfectly (double) fried – crispy outsides, fluffy insides. Why can’t everyone make fries this way?! We went back on our last day when the weather had decided to warm up. 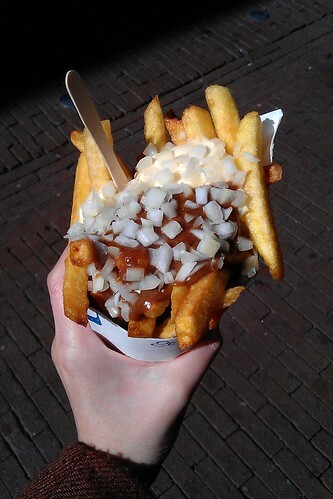 This time, patatje oorlog (literally ‘war fries’) – frites topped with mayonnaise, satay sauce and chopped onions. It’s a crazy combination that works…and I’m drooling over my keyboard as I think about it. I was a bit skeptical of the satay sauce they use on chips in the Netherlands but this completely converted me. Sure, it’s a bit peanut buttery but it’s just so good. One Dutch man was singing the praises of his chosen samourai sauce and that’s what I’ll have next time, I reckon! We had had a mostly good first full day in Amsterdam. The morning had been spent wandering the old canals as it snowed on us but the afternoon was full of disappointment as we learned that the Rijksmuseum was still closed for another 2 weeks. We’re still not over our disappointment but what helped dull it was our very fabulously Dutch meal that evening. We headed to Hap-Hmm, where I’d read that we’d be able to get a very typically Dutch meal at very typically Dutch hours (the restaurant is only open Monday to Friday, 16:30-20:45 – and the kitchen closes at 20:00). The place has been running since 1923 and that’s got to be a good sign! We dropped in quite early – about 6pm – and we found the cozy restaurant absolutely packed. We didn’t have to wait long for a table though. Customers were a mix of tourists (very few), young Dutch people out in groups, and older bachelors and widower (the largest group that early in the night). That last group was made up of regulars who went around from table to table socializing. I loved the cozy atmosphere, the hum of chatter from the regulars and the friendliness of the waitresses. 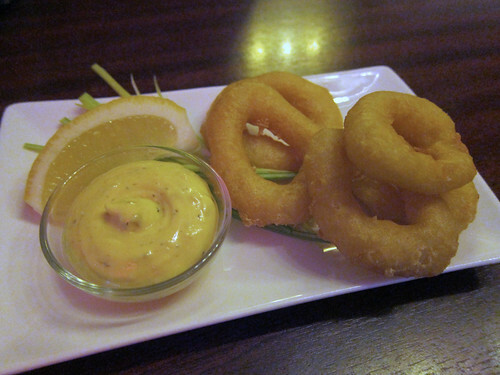 Prices are definitely in the budget region and we decided to push the boat out by first splitting a calamari starter (€3,75). These were from frozen but were excellently fried and the remoulade sauce alongside was also very good. 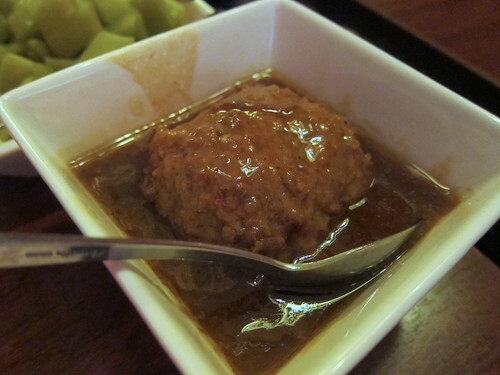 We split a Grandmother’s meatball (€7,50) and a pork schnitzel (€8,50) (after seeing it on someone else’s plate!) 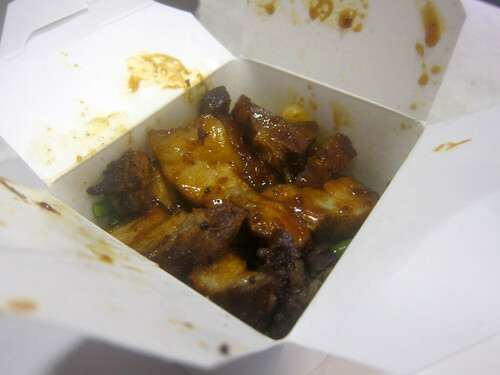 and substituted fried potatoes in place of the usual boiled (€0,50 per order). 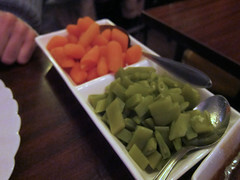 Apparently we had our choice of vegetables but we didn’t know and so were served the default boiled carrots and potatoes. Around the room, we also saw boiled spinach, beetroot and broccoli. The meatball was fabulous with plenty of gravy for the accompanying chips. 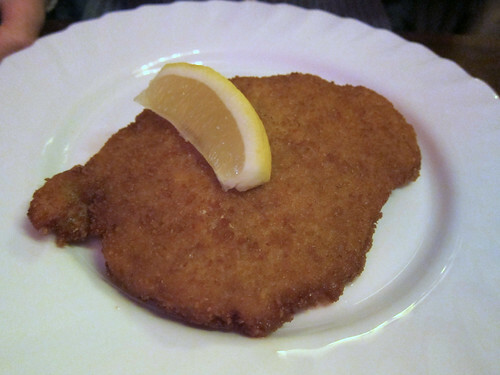 The schnitzel too was well fried and tender. You couldn’t ask for a more honest homely meal. Desserts available were recited to us and even though our stomachs were strained after eating so many of those fried potatoes, we chose a pancake (€3,60) and a serving of pistachio ice cream (€2,60). 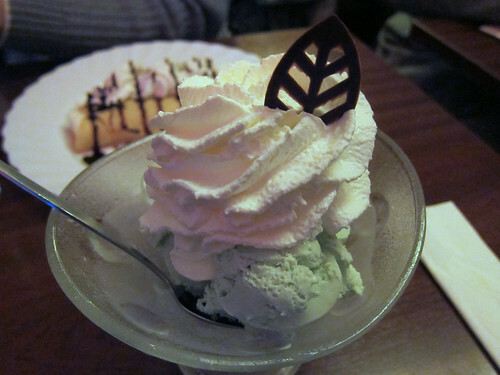 The pistachio coupe was full of the old fashioned kind of pistachio ice cream which went down surprisingly easily. 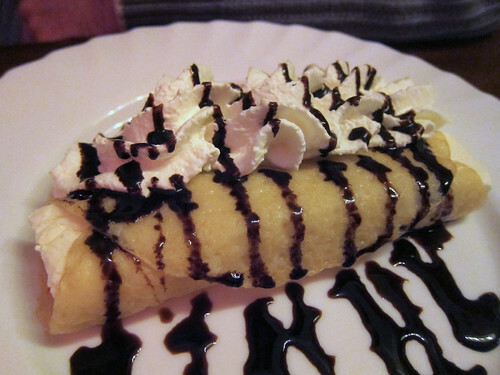 The pancake was surprisingly fabulous, being filled with a slice of vanilla ice cream before being covered in chocolate sauce and whipped cream. I loved the place and wouldn’t hesitate to return the next time we’re in Amsterdam (and there must be a next time to see the Rijksmuseum!). Gosh, I’m so hungry now. Easter time was Amsterdam time for us! I’d been looking forward to our first visit to the low country city and I’d been really looking forward to a rijsttafel meal. 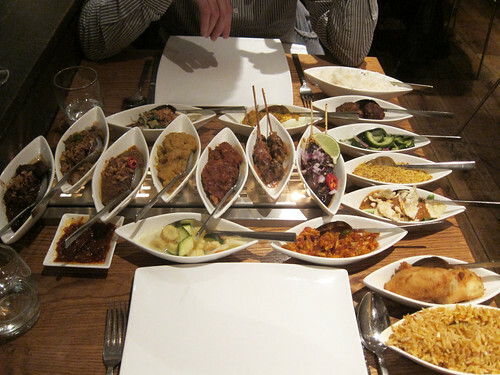 This Dutch-Indonesian meal is made up of lots of different dishes that fill up entire table and which are served with rice (the name itself translates to ‘rice table’ in Dutch). While there are similar rice and lots of dishes meals in Indonesia (see nasi padang or tumpeng), rijsttafel is truly Dutch-Indonesian. While researching Indonesian restaurants in Amsterdam, I eventually decided to skip the usual places and go somewhere a little more modern. Blauw seemed just what I was looking for and had great reviews too. On the evening we arrived in the city, we ended up hustling to make our reservation due to a tram jam but luckily they held our table for us. The restaurant is made up of many layers of levels; to reach our table upstairs, we first had to go down then up! 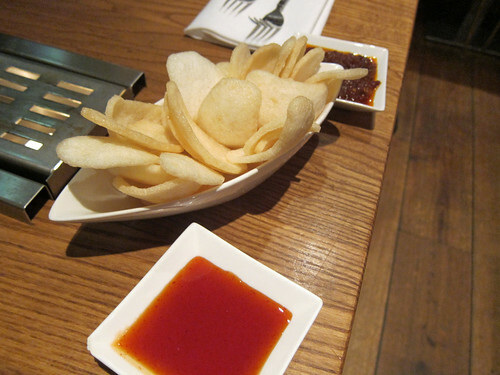 Our table was already set with a generously filled basket of prawn crackers and two chilli-based dips. The chilli sauce was fine but it was the sambal that triggered childhood memories, despite the ingredients needing a longer cooking down. As we were absolutely starving after our journey (we took the Eurostar and changed at Brussels for a Thalys train to Amsterdam), we made short work of these. 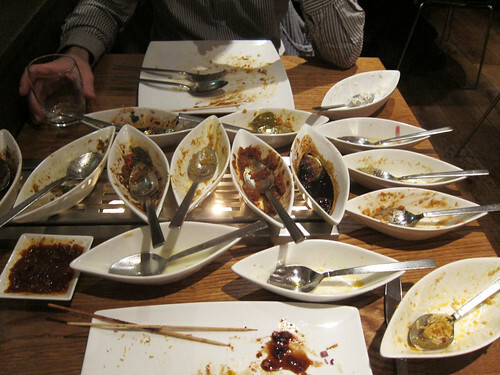 It was made up of 18 different little dishes of a good variety of things. On the warming plate were pork, beef, and fish dishes – I loved the babi ketjap on the far left and the fish dishes on the right. The rendang served was also very good. And at the bottom right was the original Indonesian version of sayur lodeh and despite it looking all white and insipid, it was full of flavour – fantastic! 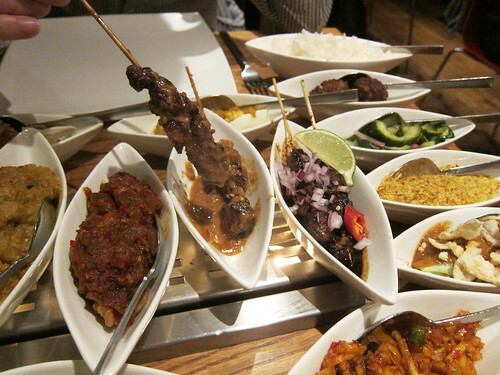 There were two types of satay – a chicken one with peanut sauce and a lamb one coated in a thick sweet kecap manis sauce (the latter is traditionally Indonesian and a variety I’d not come across before – I want to learn more). Fried bananas, the famous Indonesian gado gado and sweet and spicy fried potato sticks (sambal goreng kentang) all made great accompaniments. There were a pair of bergedil (fried meat and potato patties), a refreshing pickled cucumber salad, a sugared toasted coconut accompaniment called seroendeng, eggs in a spiced nutty sauce and fried tofu in a kecap manis based sauce. 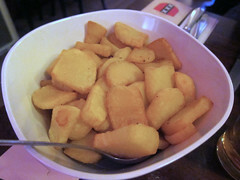 Two kinds of rice – putih (white) and goreng (fried) – to eat with everything completed the meal. We doubted our abilities to finish it all but we shouldn’t have worried! 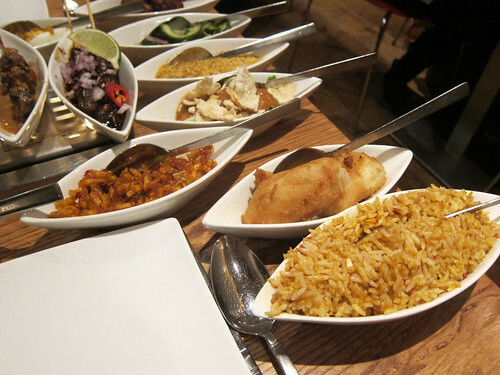 That’s not to say there wasn’t enough food – we were utterly stuffed! If anything, it just shows what pigs we are. 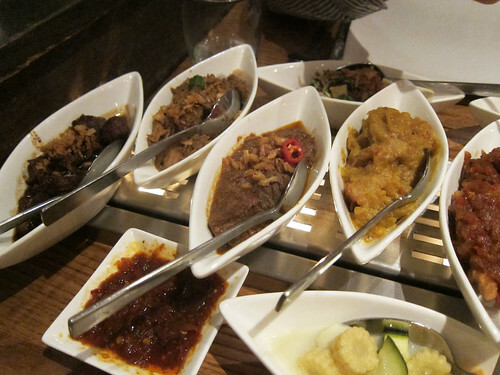 While we could tell that the flavours of the dishes were muted (under the assumption that Indonesian food can be as highly spiced as Malaysian food), this didn’t stop us from having a grand time at Blauw. We even managed to fit in a dessert. 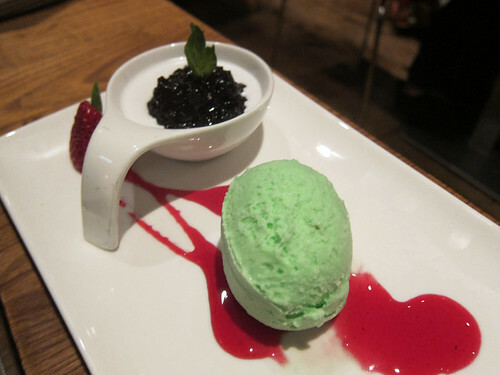 Es ketan hitam is the traditional black rice cooked with coconut milk and here served with a pandan ice cream. The dessert portion was a little on the small side for €7,75 but it was just right for two who had stuffed themselves on rijsttafel. Service was excellent with everything explained to us, waiters happy to answer our questions, and our never feeling rushed. 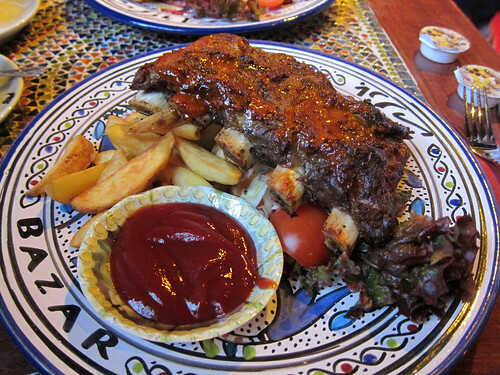 So, yes, I’d recommend Blauw for Indonesian food if you’re ever in Amsterdam. If you’re not up for all that food, you can order a la carte and each dish comes with the two types of rice, seroendeng, sayur lodeh, sweet and spicy fried potato sticks, and pickled cucumbers. 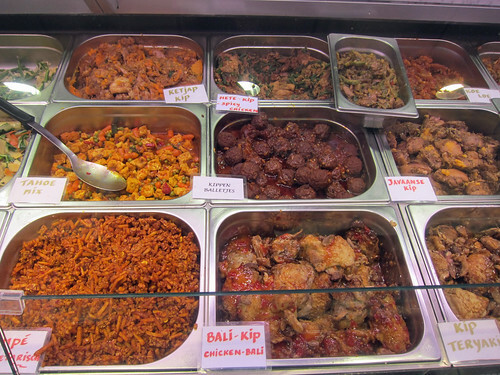 For Indonesian food in London, I’ve only tried the Indonesia Mini Market. Does anyone else have any other recommendations please?